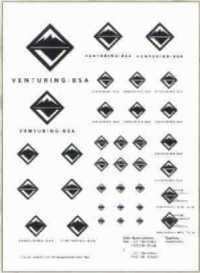 This is a full page of black-and-white, camera ready Venturing logos. The logos appear in eight different sizes and include color specifications for printing in yellow and green and in yellow and maroon. This three-panel, full-color brochure is designed to help promote Venturing to individuals. Space is provided on the back of the brochure for specific council information. 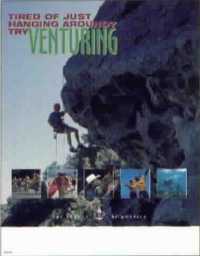 This 18-x-22-inch full-color poster is designed to promote Venturing. Space is provided at the bottom of the poster to customize with open-house other specific council information. 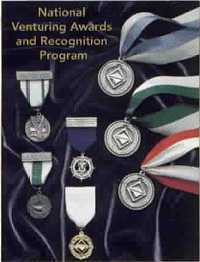 This full-color brochure illustrates and describes Venturing youth awards and scholarships and adult recognition items. 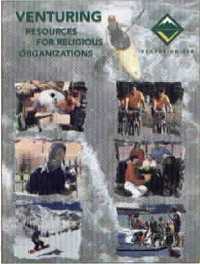 This colorful folder contains specific information designed to help a unit-serving executive or volunteer new-unit organizer sell Venturing to a religious organization. It is designed specifically to help a religious organization adopt Venturing into its high school-age youth group. The folder provides space to customize with local information.